Last Saturday my wife and I enjoyed a true Redwood City day. The Redwood City Public Library is putting on a series of events under the category of “Meet Your Neighbors,” the second of which took place last Saturday. The event was titled “Meet Your Chefs,” and it sounded like something we didn’t want to miss. Nearing El Camino Real I also noted that the section of fence that had been damaged when one of Sequoia’s large trees fell onto Broadway had been repaired, with all but the uprooted tree stump removed. Arriving at the library we proceeded up the main stairs to the Community Room, which is on the third floor. If you haven’t been up those stairs, I highly recommend it: there are a number of great photographs of old Redwood City along the stairway, and the library’s local history room is up on the second floor. The climb is worth the effort for the photos alone. The room was set up with a long table in front for the speakers, a long table in back where food was being set out, and a great many chairs in-between, facing the speaker’s table. When we arrived—about ten minutes before the event was scheduled to begin—only the first couple of rows were mostly full; the bulk of the seating was still available. The chefs who were scheduled to speak were standing near the back, while a handful of people were hovering around the food table, hoping to get something to eat before the event began. As we waited, people filtered into the room. Even after the event began people continued to come in; eventually nearly every seat was taken and people were standing around the perimeter of the room. The event was terrific. I enjoyed hearing how each chef got started, and what their passions are. As they spoke, the chefs joked and teased one another as old friends might do. Their passion for food and for sharing their unique vision with their customers was clear in their answers. And the three owner/chefs made it a point to address downtown Redwood City’s recent transformation, noting how much of a positive difference it has made to their respective businesses. In particular, Donato Scotti talked about how, when he started here some nine years ago, our then-mayor told him that big things were coming. Based partly on that Donato took a chance on Redwood City; he’s delighted that what he had been told came true. Indeed, he’s so happy with how things are going that he recently opened Cru Wine Bar and Merchant, which is slowly winning a following of its own. Mike Hashemi told of opening Arya and then watching with a sinking heart as Middlefield Road was closed for the construction of the Box buildings directly across the street. He thanked everyone who patronized his restaurant during that tough time, noting that those who were willing to park elsewhere and walk to his restaurant kept him afloat. 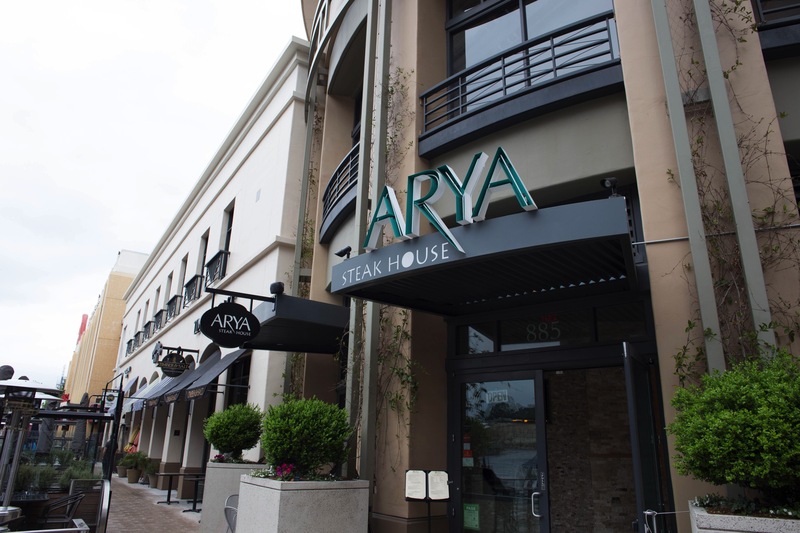 From its inception until recently Arya has been a Persian restaurant, matching the successful formula that works so well at Arya’s Cupertino location. But recently the Hashemi’s decided to shake things up here in Redwood City. Noting that our downtown doesn’t have what one might consider a true steak house, they recruited a new Executive Chef, Brenda Mora. Chef Mora, a friend of theirs with whom they had been wanting to work for some time, had been the Executive Chef at LB Steak on San Jose’s Santana Row. Together they remodeled the Redwood City restaurant to have more of a “steak house vibe” and created a new menu that features traditional steak house fare while retaining some Persian elements (including their yummy Kabobs). If the audience wasn’t hungry going into Saturday’s event, hearing from this group surely made them so—as it did for the four of us! When the allotted hour had elapsed, the audience was invited to partake of the food in the back: a variety of tasting items made by the five speakers. A handful of us, who weren’t eager to join the mob rushing the food table, instead used the opportunity to speak with the chefs individually. I chatted briefly with most of them, spending the most time with Chef Mora: I wanted to know more about what Arya was up to. She proved to be such a delight to talk to that my group decided on the spot to have dinner that night at Arya. Thanks to OpenTable, I quickly booked a five o’clock reservation. By now it was 3:30, and dinner was ninety minutes and less than a block away. What to do in the interim? Drinks and appetizers somewhere! We considered LV Mar, but it was a bit far for one of our group. Timber & Salt was close, but they don’t open until four on Saturdays. Thus we headed over to Cru. I’ve written about Cru before, so I won’t provide a full review here. But our choice was validated when we stepped outside and realized that the day’s early gloom had given way to a lovely sunny afternoon: Cru has some great outdoor seating. 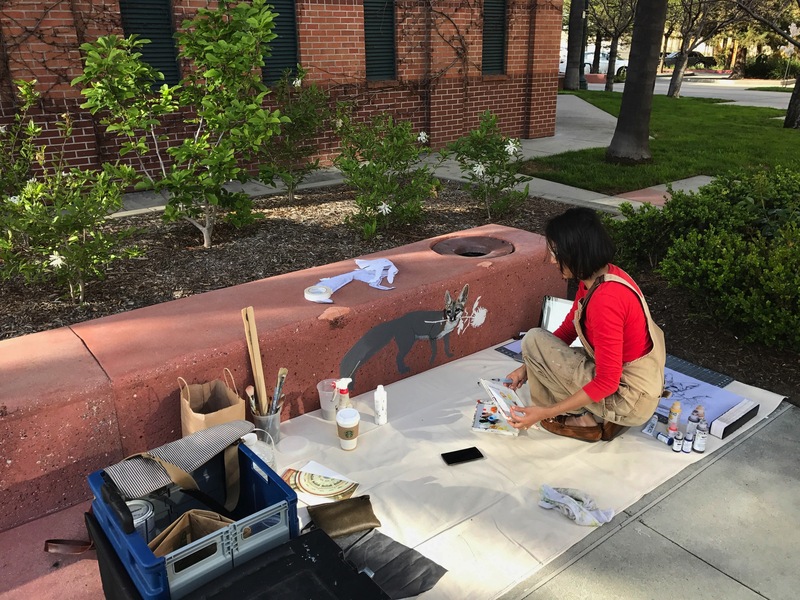 Kim has since completed this particular work and has moved on to the next in the series of animal images (all bearing chrysanthemums) that will be scattered around our downtown: as of this writing she is now on Marshall Street, painting squirrels onto the entrance of the Marshall Street garage. After admiring the artwork, we made the short walk to Cru, where we plopped down at an outside table and ordered glasses of wine and appetizers to share. Fortunately it was not too hot that day: at the moment Cru has no outside umbrellas, so there is little shade. 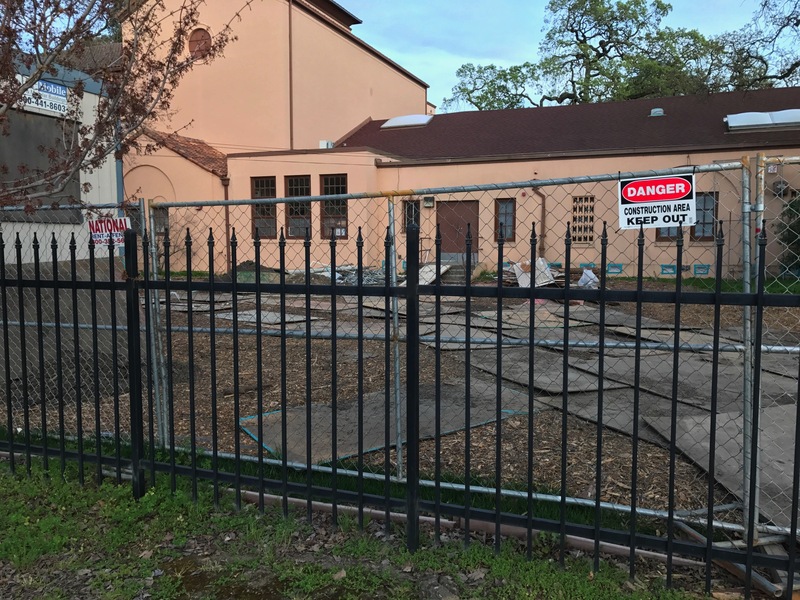 We were told that they’ll be getting some soon, and anyway you can always sit inside if the lack of shade is a problem (or if the rains persist). When five o’clock rolled around, we strolled over to Arya where we were greeted warmly. As we were being seated we were welcomed by co-owner Fera Hashemi, who had been at the event and recognized us as attendees. She told us that not only would Chef Mora be overseeing the preparation of our meals personally, but that the chef would be out to see us at some point during the evening. We chatted about the business and admired the updated interior decor before finally settling down with our menus. The great thing about dining with others is that it gives you an opportunity to try a variety of dishes. In our case we ordered a 6-oz Filet Mignon, a 24-oz Porterhouse (which was shared by two people), and a 12-oz Dry Aged Ribeye. Side dishes are extra: we ordered two Twice Baked Potatoes (which are huge; we could have gotten by with one), the Herbed Wild Mushrooms, and Adas Polo (a Persian rice dish with lentils, dates, and raisins). I also ordered a French Onion Soup from the Appetizer list. And, of course, we ordered wine. Plus, because we were giving the new Arya a try, three different desserts. Everything was really good, which was a bit of a relief since Chef Mora did indeed drop by our table to see how things were. We ended up with far more food than we could consume, taking home a nice serving of Porterhouse steak (24 ounces was more than even two could eat!) and most of one of the potatoes. The desserts were very nice, with one standout: the Chocolate Eggshell was really something. It may have its drawbacks, but Redwood City’s growth has a number of positives as well. Our downtown dining and entertainment are now so appealing that they are drawing in people from surrounding communities as well as from Redwood City. While I will continue to report on both the positives and the negatives, I, for one, plan to enjoy those positives (including the next event in this series, “Meet Your City Advocates” on April 8 at 2 p.m.). My wife and I staked our claim here in Redwood City some 29 years ago when we bought our current house, and now it seems we are able to claim our steak, as well! It was so nice running into you and your wife downtown. We ended up eating at the new Yokohama location, but will have to check out Arya soon! Hope you had a wonderful weekend!